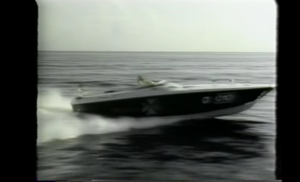 Check out this throwback article and video from the late 1980’s, featuring the Miami–Nassau–Miami Sea Races! The 362.3-mile Miami-Nassau-Miami Searace, for powerboats more than 28 feet in length, has struggled to gain its share of recognition since its inception in 1986. Only 13 boats — combined — competed in the first two races. Only one boat each year has finished. And only one man, Miami boat manufacturer Ted Theodoli, has ever won. Little has detered race founder and director, John Crouse of Miami. Crouse did decide to make two changes in this year`s event. The races will again originate and conclude at the Biscayne Bay Marriott Hotel and Marina. The longer race will begin at 9 a.m. near the entrance to Government Cut. The smaller boats will follow. But as the larger boats head to Nassau, the smaller ones will return around South Gun Cay back to Miami. Crouse said with 20 small boats, the winner would get $15,000. “Smaller boats can still compete in the long race,” Crouse said. Theodoli won in 1987 aboard his 63-foot Maltese Magnum, which has twin 18- cylinder CRM diesels at 1,900 horsepower apiece. Theodoli averaged 58.67 mph over smooth seas while covering the 362.3-mile course in 6 hours, 10 minutes, 30 seconds. Theodoli won in General`s Titan in 1986. The 1987 round trip was 1 hour, 18 minutes faster. Crouse said the switch to October is a gamble because the race will be contested during the heart of hurricane season. This article was originally posted on Articles.sun-sentinel.com.